The following is an outline of a Christian funeral service, typically performed in a church. 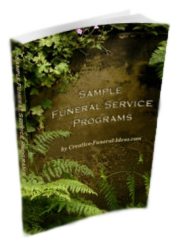 We also provide a downloadable eBook of sample funeral service programs. The Christian Funeral Service begins, where possible, with organ music. Other instrumental and/or vocal music may be performed. Priest: "In the Name of the Father, and of the Son, and of the Holy Spirit." The Priest then gives the Homily - a short sermon, usually from some part of the Bible. The homily ends with the following prayer, with a prayer from the Service Book, or with an informally worded prayer. Priest: "Lord our God, you are the source of life. In you we live and move and have our being. keep us in life and death in your love, and, by you grace, lead us to your kingdom, Through your Son, Jesus Christ, our Lord." Congregation: "Amen." Priest: "In the Name of God, the merciful Father, we commit the body of (the name of the Deceased) to the peace of the grave." or "God, our Father, we entrust (name of the Deceased) into your hands"
The priest makes the sign of the cross or lets three hand-fulls of earth fall onto the coffin, saying: "	You gave him life. receive him in your peace and give him, through Jesus Christ, a joyful resurrection"
Following each of the alternatives above, the priest continues: "Lord God, our Father in heaven, Lord God, the Son, and Saviour of the world, Lord God, the Holy Spirit, have mercy on us. At the moment of death, and on the last day, save us, merciful and gracious Lord God." Bible Reading:Priest: "Let us now listen to the words of Holy Scripture that assures us of God's safe-keeping in life and death." The priest reads a few texts from the Bible. Priest: "God, we thank you for the life that you give us. It is full of work and of responsibility, of sorrow and joy Today we thank you for (name of the Deceased), for what he has given and received. Help us in our mourning and teach us to live for the living in the time that is still left to us. Thank you for eternal life that can give light and joy to our days and years already here on earth. God, we thank you for your Son, Jesus Christ. Help us to see that it is he who opens the gate to the life that shall never die." or (a sung funeral prayer) " O Lord God, who has created us and called us to come home to you Give us hearts of wisdom, that we may understand how short life is and thus receive every new day as a gift. Give us a living faith in your Son Jesus Christ, who suffered death for our sins, who rose from the grave to give us a hope and who lives for ever. Teach us daily to die from sin and to live according to your holy will. At the moment of our death, make us ready to depart in peace. And when the eternal day of resurrection dawns upon the graves of the earth, grant us grace to rise to eternal life." Congregation:" Amen." The priest may say: "Let us say the Lord's Prayer together:"
Congregation:"	Our Father, who is in heaven. Let your name be kept holy. Let your kingdom come. Let your will be done on earth as in heaven. Give us today our bread for the day to come. And forgive us our sins as we have forgiven those who sin against us. Lead us not into temptation but deliver us from evil. For the kingdom. the power and the glory are yours now and for ever. Amen. Our Father, who art in heaven. Hallowed be thy name. Thy kingdom come Thy will be done on earth as it is in heaven. Give us today our daily bread and forgive us our trespasses as we forgive those who trespass against us, and lead us not into temptation but deliver us from evil. For thine is the kingdom, the power and the glory, for ever and ever. Amen." The priest may say: "Receive the Lord's blessing. The Lord bless you and watch over you. The Lord make his face shine upon you, and be gracious to you. The Lord look kindly on you and give you peace; In the Name of the Father, and of the Son + and of the Holy Spirit. "Congregation: " Amen." Instrumental and/or vocal music can precede the recessional music. The coffin is lowered into the grave. The mourners take their farewell. The priest goes to the graveside and reads the following or another final prayer. " Give him, o Lord, your peace and let your eternal + light shine upon him. "Congregation:" Amen." "Let us go in the peace of the Lord." The priest goes to the coffin and says this or another final prayer: " Give him, o Lord, your peace and let your eternal + light shine upon him." Congregation:"	Amen." Facing the congregation, the priest may say: "Receive the Lord's blessing. The Lord bless you and watch over you. The Lord make his face shine upon you, and be gracious to you. The Lord look kindly on you and give you peace; In the Name of the Father, and of the Son + and of the Holy Spirit." Congregation:"	Amen.